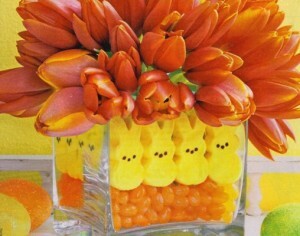 I am not hosting Easter this year, so I don't have a tablescape to share with you today, but if you are reading this for last minute ideas I do have a few of those to share. I'm not a very well organized person. I do a lot of things at the last minute (imagine). Because of this I am a great "dump and fluffer". What does this mean? Well, just that I buy things (usually at a store I'm already at like the grocery) and then dump them in a container and fluff them up. Incorporating this method into your Easter planning I've listed some ideas with materials that would be available at your grocery store. 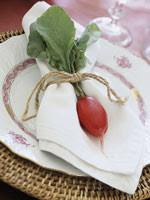 The above image is from countryliving.com and is a simple radish and twine used as a napkin ring. I was thinking you could also use a single tulip or daffodil as well. How about this idea above, also from countryliving.com. Take clipart printed from the computer and insert it into the inside of a large glass container. Then use a small container or can and fill that with water and your favorite blooms and insert it into the larger container. 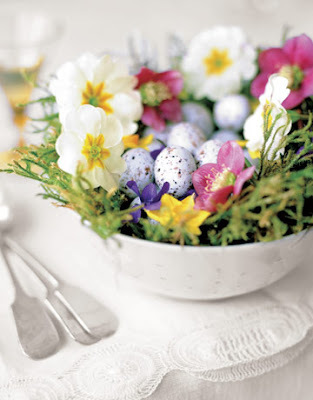 This last idea is just a simple bowl filled with pansies and dotted with speckled candy eggs. I think several of these down the center of your table would be really cute. I'm joining Susan over at Between Naps on the Porch for Tablescape Thursday. Come back tomorrow when I'll have a bunch of Victorian Easter clip art to share. oh, I just love those ideas for centerpieces, thanks! So many nice ideas, thank you. I prefer the one with the radish. So simply and yummy. Will work also after Easter.